Let me say right upfront that I absolutely loved this book. As someone who has spent 3 months living in Chicago, it was fascinating to read about the history, especially presented in this historical fiction format. 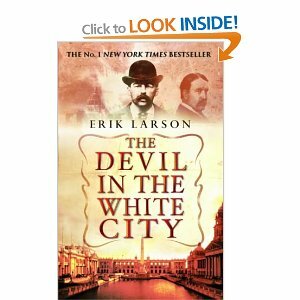 Larson intertwines the two separate tales of the Devil and the White City, as well as the separate tales of the cities themselves )Black and the White), brilliantly. Almost as if there was inevitability that one lead to the other. Surprisingly though I thought it ran out of puff a bit. Definitely all the good bits of this story are in the build up, the drama around the building of the white city and the uncertainty surrounding it, the preparations made by Dr H. H. Holmes as he creates his own hell on earth, just around the corner. But once the city is built, and the crimes have been committed, there seems little more to keep you interested, other than the less dramatic and inevitable demise of each in their own way. Larson tries hard, but I suppose the drama is in the ascent, not the descent! There are lots of interesting references in the footnotes to “In Cold Blood”, and the inspiration that Larson took from that other historical fiction book. I will read that with great interest now that this initial foray into the genre has been so satisfying!